I also want to make mention of something very important to a special family whose lives became intertwined after a “chance” meeting in the grocery store. Suzie recognized me from the blog in the freezer aisle and introduced herself. After I mentioned our sweet exchange on the blog that night, it was figured out that her sister (and sister’s husband) are good friends of my parents! Small world it is! A few weeks later I met Suzie’s sister Sharon at my sister Emily’s wedding which is where she excitedly explained the connection to me. How awesome that so many of these connections are being made that otherwise might not have been but for Nora. I was shocked when literally a few days later my Mom called to tell me that Sharon had been suddenly diagnosed with Myelodysplastic Syndrome. I was very shocked to hear the news and immediately put in a prayer request for her at my Bible study. I’ve been in touch with Suzie over Facebook. She was also the one who so thoughtfully hand-delivered a stuffed animal kitty cat to Greta the afternoon that Patches went to heaven. In talking with Suzie that afternoon she shared with me how desperately and urgently her sister needs a bone marrow transplant. She said she feels so helpless in all of this after it was determined that she was not a match to literally save her sister’s life by being a donor. 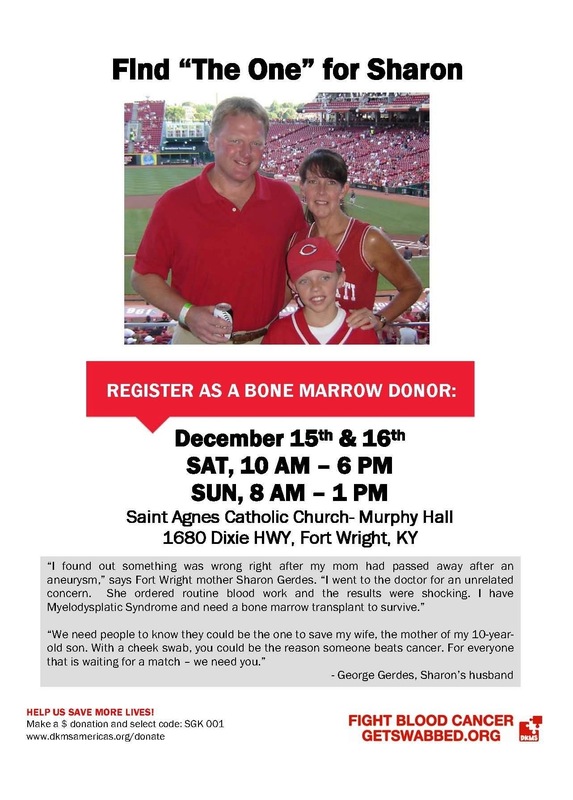 In a recent message from Suzie she informed me of a bone marrow drive taking place this weekend at St. Agnes Church in Northern Kentucky. It’s purpose is to find a match for Sharon. I had to make mention of this on here to get the word out in the hopes that you can find it in your heart to go do this! It only requires a cheek swab and a couple minutes of your time. I definitely plan on going! If you are not able to do this, I ask that you please pray that a donor is found quickly and for Sharon’s healing. Please pray for her and her family’s peace of mind. May they experience joy amidst their struggle and fully feel their security in Christ. I have commented from time to time on this blog about what a blessing little Nora has been to my family. I have a daughter a few weeks younger and during the early days, I would read your blog aloud as we nursed (most often during the 3am feedings). Now that I’m back to work, this is the first thing I read each morning as I start my day at the office with coffee. While I am no where close to you and can’t register at the drive, I just want you to know that I registered online to become a donor and am anxiously awaiting my swab kit. If not for Sharon, hopefully for someone else. Thank you for constantly reminding me that just because we all face trials in our life, it doesn’t mean that we can’t reach out and help others. Feeling very blessed this morning and have added Sharon to the top of our prayer lists. And I love the Santa pics and am so glad little miss is here to celebrate! So wished I lived anywhere near northern KY; I will be praying for this family. Thanks Aleisa for making us aware of this great need. Do you know whether or not they have checked with the “Be the Match” registry? It is a national marrow donor program and registry. I am registered with that organization as a potential bone marrow donor. It is very easy and painless to register. The website is http://www.bethematch.org. I pray that Sharon is able to be matched with someone quickly! Yes, she has been through the national and international data bases, with no match being found. The foundation we are doing the drive with (DKMS) also works with “Be the Match”. So all results from our drive will go into that national data base. Hopefully not only will a match be found for Sharon, but also for another who is in need.. Thank you so much for the prayers, our family appreciates it more than you will ever know! Thank you so much Aleisa for sharing this info and Brittany for getting your kit. It is so amazing to see the enormous community our beautiful Nora has brought together and the love and faith that lives in it! God Bless! Wish I could be there for the drive. I am on the National Registry though, and will be praying that she finds a donor soon! I’m also on the National Bone Marrow Registry. I’m a medical scientist and my job is essentially diagnosing cancer in blood, bone marrow, lymph nodes etc. every day, so I am very familiar with MDS – it’s kind of like “pre-leukemia” and is a scary diagnosis to receive. Your friend Sharon is in our prayers, and I hope they can find a match for her somewhere.